Green Brick Award winners (left to right) Reggie Howell, Mary Paz Alvarez Valverde, Engineers Without Borders president Michelle Lishner, Dr. Ryan Emanuel, and Food and Housing Security initiative representatives Sarah Wright and Dr. Mary Haskett. 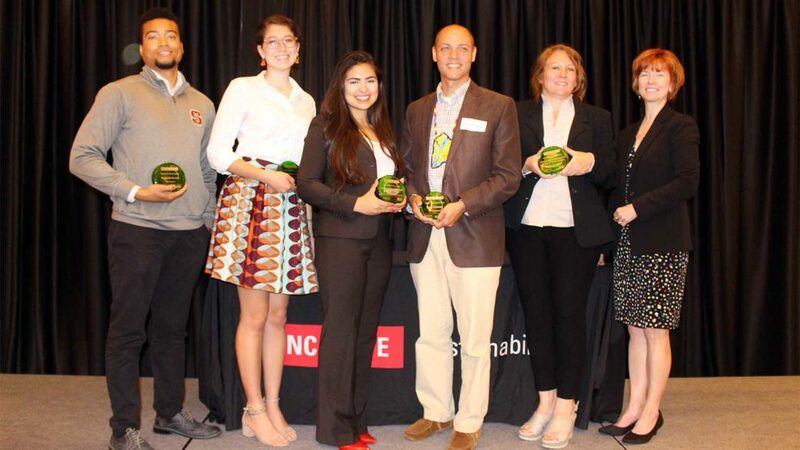 The NC State Sustainability Council announced the 2018 recipients of the university’s Green Brick Awards at an April 26 ceremony recognizing outstanding contributions to sustainability. The Green Brick Awards have recognized sustainability achievements at NC State since 2004. Each spring nominations are received from the campus community and a selection committee determines a winner in the following categories: Student, Faculty Member, Staff Member, Innovation/Impact and Campus Department or Student Organization. This year’s student winner is Mary Paz Alvarez Valverde. A Sustainable Materials and Technology major in the College of Natural Resources, she began her sustainability efforts at NC State the day she stepped onto campus. As a part of the EcoVillage living and learning community in Bragaw Residence Hall for two years, she engaged with sustainable projects and practices. Last fall, she worked as an intern with NC State’s Waste Reduction and Recycling Office, where she helped push the football season composting totals in Carter-Finley Stadium from 8,900 pounds in 2016 to almost 28,000 pounds for the 2017 season. Reggie Howell, a marketing manager with Campus Enterprises and Talley Student Union, is the winner of the staff award. This spring, Howell gave up a week of his time to serve as the advisor for an Alternative Service Break trip focused on environmental justice. Howell also serves on the Campus Enterprises sustainability task force and has organized outreach events to teach Talley occupants and visitors about the building’s composting and recycling initiatives. This year’s faculty winner is Dr. Ryan Emanuel, an associate professor in the College of Natural Resources. He researches hydrology and has authored articles related to watersheds, groundwater, climate change and land use. In 2017, Emanuel helped organize North Carolina’s first tribal environmental summit, where leaders of the state’s eight Native American tribes met with state and federal officials to discuss issues surrounding environmental justice, sustainable development and indigenous rights. He also consulted extensively with the NC Department of Environmental Quality on its environmental justice review of the Atlantic Coast Pipeline project. NC State’s student chapter of Engineers Without Borders is the campus organization winner. This student organization is dedicated to building a better world through sustainable engineering projects that empower communities to meet their basic human needs. Currently, the chapter volunteers in Guatemala, where students developed rainwater catchment systems for houses, and Sierra Leone, where students have provided a school with access to clean water and reliable, renewable energy. These sustainable engineering projects have directly impacted more than 1,000 people. This year’s innovation and impact winner is an initiative focused on Food and Housing Security Among NC State Students. Under the leadership of Dr. Mary Haskett and Sarah Wright, this initiative has sought to ensure all NC State students have access to sufficient, nutritious, culturally appropriate and affordable food as well as safe, affordable housing that is accessible to the university. This project developed a campus and community steering committee, conducted a research survey on campus, and is helping create solutions to improve food and housing security among NC State students. Sponsored by Coca-Cola, the Green Brick Award winners are selected for sustainability commitment, impact and leadership above and beyond work or academic requirements.